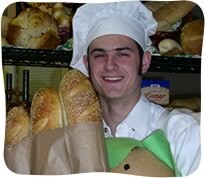 At Fill A Bagel & Breads, serving the highest quality bagels and baked goods is our passion. 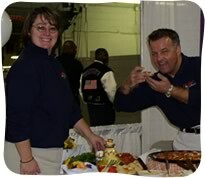 We serve our customers like they’re our family, and strive to make your catering a superior experience. This commitment to the highest quality food and customer service has earned us numerous business awards. We also contribute to the communities we serve and donate daily to local charities. Our Fill A Bagels are made the "Old-Fashioned Way"…mixed, boiled, and baked completely on our premises. We feature 17 different varieties of bagels daily. Stop by and watch our bakers create your favorites. Our homemade cream cheeses make your bagel an extraordinary experience. Try some of our customer favorites…lite veggie, sundried tomato & basil, apple cinnamon raisin, and jalapeno cheddar. When it comes to deli, only the freshest ingredients are good enough for a Fill A Bagel sandwich. Sink your teeth into our select, gourmet-quality Dietz & Watson superior lite and lean deli meats and upscale cheeses. Try our salads…egg, chicken, whitefish, just name your favorite. And we’ve got the freshest Nova in town! Or for you vegans, try one of our fresh salads or a Salad Bagel on a gluten free bagel! Oh, and the Breads, They are Wonderful! Crusty on the outside and soft on the inside, a taste that only the hearth can create. Fill A Bakers create up to 20 types of breads and other pastries daily. Our muffins, sticky buns, and NY style Black & White cookies are worth every bite. Try one with a La Colombe coffee, or an espresso, cappuccino, or gourmet tea. hors d'oeuvres. Our fish platters, they are gorgeous! Give us a call and we’ll create a custom gift basket that’s sure to please.